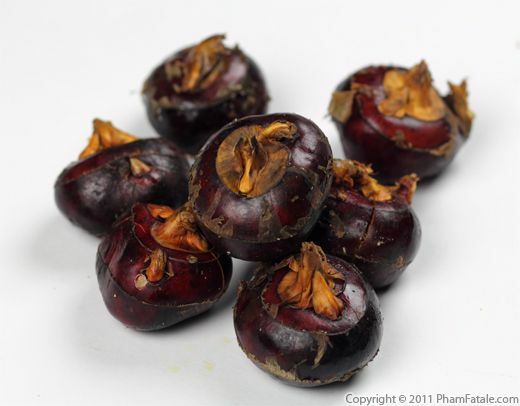 Chinese water chestnuts, most commonly known as water chestnuts, are not nuts. They are an aquatic root vegetable that grows in the mud. They're small in size and round. Water chestnuts can be eaten raw, par-boiled, grilled or pickled. I usually par-boil them and sauté them with other ingredients. The white flesh is crisp and adds a nice balance of texture to a lot of dishes. In the past I've received questions about what water chestnuts look like. I realized I had never posted pictures of the ingredient. Hopefully this inspires you to try them fresh! I made vegetarian fried pot stickers today. 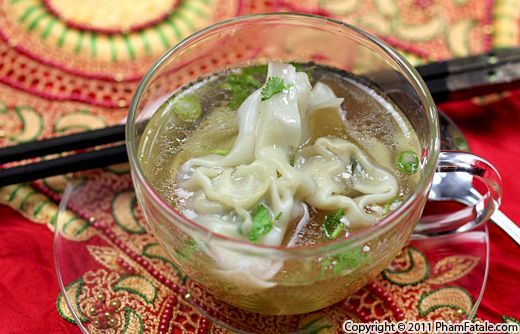 I filled them with fresh water chestnuts, mung bean paste, shiitake mushrooms and fresh soy bean paste (packed with protein). 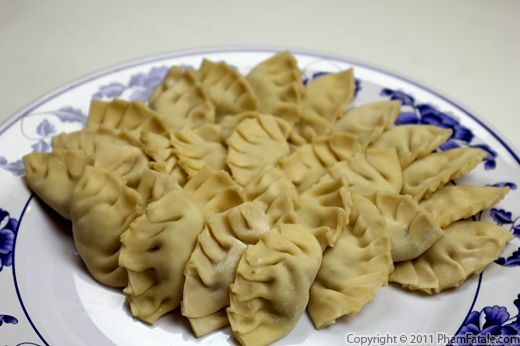 Folding pot stickers is a little tricky, and I think it's the biggest challenge the first time you try. 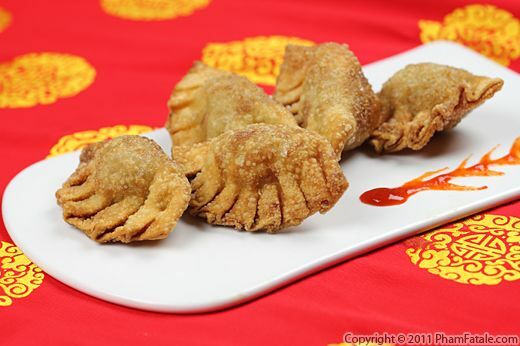 The key is to ensure that it is well sealed so the filling doesn't leak while frying. With a little practice it gets really easy. I usually serve them as appetizers. Even the meat eaters like them because soy bean paste has a similar texture to ground chicken. Also, who doesn't like fried food? Timbale means "drum" in French. 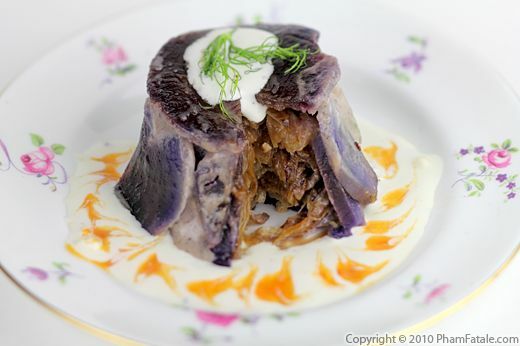 Potato timbale is just a fancy name for a potato dish baked in a drum-shaped round mold. What I like about this dish is that it's very convenient when we host dinner parties because the servings are individual. Plus it makes a nice, appealing presentation. Potatoes are par-boiled, sliced and placed in the shape of a round mold. Then, it's filled with whatever you like. I packed the potato cups with braised fennel, water chestnuts and blue cheese. This is what I call true comfort food if you want to serve a feast ("un repas de fête" in French) for Christmas. Here's a stuffing recipe that really packs a crunch. Pecans and water chestnuts provide flavor as well as a nice texture contrast. I added a fennel bulb for a mild licorice flavor, mushroom salt and a small amount of jalapeño for a bit of heat. For a fancier stuffing, you can add some crumbled blue cheese to the croutons. I finished the pecan stuffing with a little parmesan for a salty (but not overpowering) note. This recipe is far more savory than the cranberry apple stuffing I made last week. The differences between the two versions really demonstrate the versatility of stuffing. Whatever your preference, there's a stuffing that you and your family will love.